Home Domain Auctions RhodeIsland.org Lost by Rhode Island Economic Development Corp.
A .org domain name came across my email this morning that caught my attention. 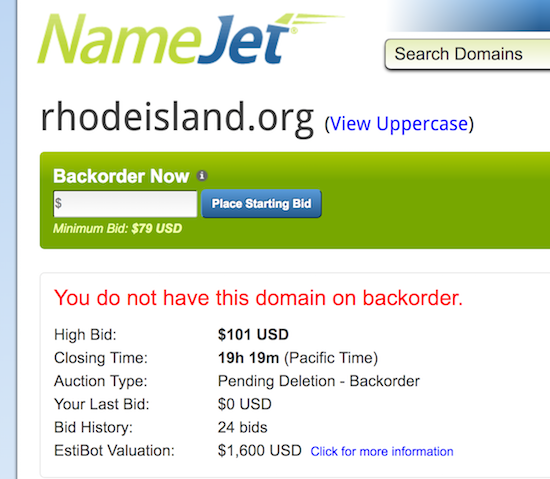 RhodeIsland.org is listed as one of the most active pending delete backorders on NameJet. At the present time, there are 24 bids with a high bid of $101 on NameJet alone. Since most of the major drop catching platforms will likely try to catch this domain name, I presume there are many other bidders standing by ready to place bids on this domain name. After seeing RhodeIsland.org on the most active pending delete list, l did a Historical Whois Search at DomainTools to see who previously owned the domain name before it went into the pending delete status. According to DomainTools, RhodeIsland.org was registered to Rhode Island Economic Development Corporation as recently as September 6, 2017. The Whois registrant email listed an @riedc.com email address. Very strangely, the registry expiry date is listed as June 24, 2018, so it doesn’t look expired despite its “pending Delete” status. I looked at Archive.org, and it does not look like RhodeIsland.org was used as a website in the recent past. An Archive.org entry from this past June shows that the domain name was forwarding to RI.gov, a website operated by the Rhode Island state government. It looks like RhodeIsland.org had been used for a website in the past, with an Archive.org entry from 2007 showing a website. Despite the fact that RhodeIsland.org doesn’t seem to have been used to its full potential, I don’t understand why the domain name is in pending delete status. From my vantage point, the domain name has commercial value and would have likely had value to a number of organizations in the State of Rhode Island. This seems very peculiar to me. The auction is set to begin sometime in the next day or so. I believe the auction start time will depend on which auction platform or drop catching service catches the domain name. My guess is this will be a mid 4 or low 5 figure sale since a .org works well with a geographic domain name such as this one. I am not sure if I will participate since I typically only buy .com domain names. Hopefully this is some sort of mix up and the domain name can be recovered. I presume the domain name will go to auction soon. RhodeIsland.org sold for $5,010 today on DropCatch.com. For some reason, all .org domains show as recently updated with expiration a year out before they drop but the status will still show PendingDelete so that is your indicator that it really will drop.